Yes, one of history’s greatest ever athletes is just a year away from the big five-oh. Join in the celebration with a dunk or 10. IT’S NOT EVERYDAY that an all-time sporting great celebrates a birthday. Indeed, many sports stars grow old without us ever really noticing. But Michael Jordan is not just any old sporting legend. 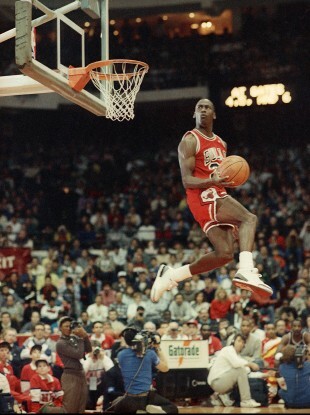 Jordan was so good he had to retire from basketball three times before the sport finally let him go. In a week where Jeremy Lin has shot to stardom as an un-drafted player who reached NBA fame by an unlikely route, it’s worth looking back on Jordan. His talent was recognised early; and he never disappointed. Before being drafted by the Chicago Bulls in 1984 he had already played, and won, for the United States in the Olympic Games. For six years he toiled away with the Bulls without attaining the elusive Larry O’Brien trophy. First, it was Magic Johnson and Larry Bird who were the ones battling it out for the NBA Championship. Then the Detroit Pistons came along and (often double or treble marking Jordan) stood in the Bulls way for three consecutive seasons. The Bulls’ golden years were from 1990 to 1998: Eight seasons, six championships with Jordan twice guiding them to three in a row. The missing link was in 1994 and 1995. The Houston Rockets wins in those years must come with massive asterisks owing to Jordan’s controversial ’93 retirement and move to play minor league baseball. Six NBA championships, two Olympic golds. Jordan, as documented in the brilliant Jordan rides the bus, was definitely improving as a baseball player. Add to that a minuscule golf handicap and you would fancy that Jordan could have succeeded no matter what sport he turned his attention. Basketball was lucky to have him. Happy 49th, Mike. Email “49 candles: Happy Birthday to Michael Jordan ”. Feedback on “49 candles: Happy Birthday to Michael Jordan ”.